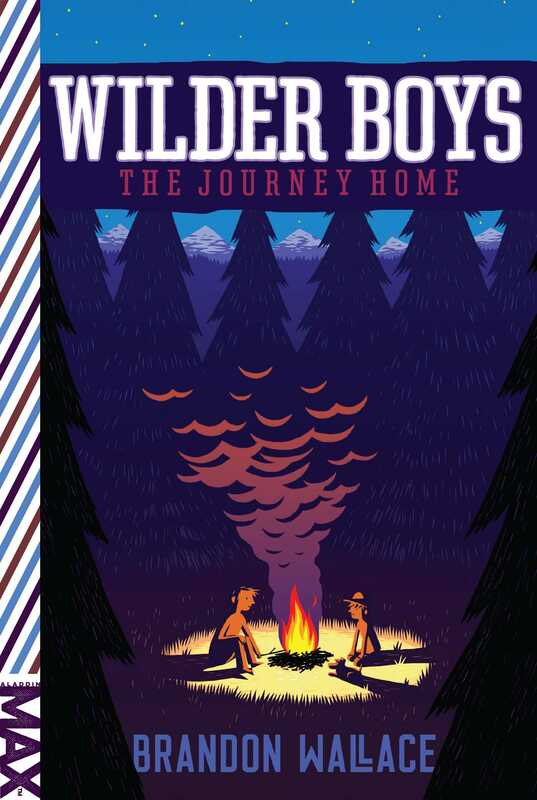 Two brothers must rely on all their wilderness skills to survive their journey home after reuniting with their father and living off the grid in the second adventure of the Wilder Boys series. At the start of the summer, Jake and Taylor Wilder set out on the adventure of a lifetime. After seeing their mother loaded into an ambulance because of Bull, her terrifying boyfriend, the boys know they are no longer safe. So they go in search of their father, who has been living off the grid in Wyoming. After jumping trains, hitching a ride with a truck driver, and hiding in the luggage compartment of a tour bus, the boys finally find him in Grand Teton National Park. Just as the boys are getting used to their father’s lifestyle—and his “my way is the only way” attitude—they learn that their mother is still alive. But if the brothers don’t give back the money they took from Bull last year, she could be taken away from them…for good. Convinced that their father isn’t going to help, the Wilder boys set out on their own again. It’s a long way from Wyoming to Pittsburgh, and with winter approaching there will be new challenges. But they have to get back. Will the brothers be able to make it back to their mother before it’s too late? 1 Jake Wilder moved through the dense forest, making as little noise as he could. His breath steamed in the shafts of afternoon light slanting down through the trees. The chill in the air was like the hunger in his stomach; gnawing, but bearable. Just about. A thought flashed through his mind: I used to be able to pick up a burger and fries for a few bucks. He closed his eyes. Images of golden fries and neon-red ketchup surfaced in his memory, and the knot of hunger tightened. Sometimes it hurt to have left all that behind. Get a grip, he told himself. Focus on the hunt. He flicked his eyes open again and took a breath. The beauty of the forest all around him was unlike anything he had seen back home in Pennsylvania. This high in the Tetons, the aspen leaves had already begun to shift from summer green to autumn gold. But the birdsong that had brought the forest to life over the summer had disappeared; almost all the birds had flown south. The forest had a haunted, silent feel now, like an abandoned house. There was still life here, though, if you knew where to look for it. Jake paused and dropped down to squat on his haunches, looking at the fresh rabbit droppings that littered the forest floor. There were still plenty of rabbits for the taking. The trick, of course, was knowing how. . . .
Jake made his way to the spot he’d picked out several days before, the entrance to a burrow near the edge of the forest. The two pegs he’d driven into the ground were still there. Working quickly, he fitted a small cross branch into two sockets cut into the pegs. Dangling from the cross branch was a loop of cord tied with a slipknot that would tighten around an animal’s neck. Now for the trap, Jake thought. He pulled his dark hair back out of his eyes and bent a nearby sapling down toward the ground. He tied the cross branch to it with a piece of string. The crossbar strained with tension but didn’t slip loose from its sockets. But if anything nudged it—like a rabbit—it would pop free and whip upward with lethal force. Satisfied, Jake crept back through the foliage and sat down on a log. Jake picked at a scab on his hand and let his thoughts wander back to his old life. He and his younger brother, Taylor, had lived a normal-enough life back in Pittsburgh. That was, until his mom’s brutal boyfriend, Bull, had beaten her and threatened them. Convinced that their mother was dead, they knew they had to get away, to a place where Bull couldn’t reach them. So they’d taken Bull’s money and struck out for Wyoming, in the crazy hope of finding the father they barely remembered. But Bull had followed them, desperate to get his money back and to silence the boys permanently. He’d chased them across half the country, all the way up into the mountains, where their dad, Abe, was living. Jake shivered as he remembered the day when Abe had fought like a grizzly to protect the boys. If their dad hadn’t shown up when he had, the boys would have been dead meat. Instead, it was Bull who had died, plunging over a mountain waterfall. Jake tried to feel sorry for the man, but it was difficult after everything that had happened. A flicker of movement in the corner of his eye snapped Jake back to reality. He quickly turned his head and trained his sight on the burrow to see the furry brown head of a mountain cottontail emerge. Even from a distance Jake could see the rabbit’s ears twitch, trying to sense danger. Jake continued to breathe slowly and steadily, not moving an inch. The rabbit seemed to think it was safe. It came all the way out of the burrow. It again sniffed the air and studied the forest in all directions. Come on, Mr. Rabbit . . . keep going. As Jake watched, the rabbit hopped along the path. Jake could feel his muscles tense as the animal’s head got caught in the snare’s loop and pulled the cross branch free of the pegs. The sapling sprang instantly upward, jerking the rabbit into the air by its neck. Heart thundering, Jake leaped to his feet and raced forward. Adrenaline washed through him. The rabbit was hanging, limp, not struggling—a clean kill. He undid the noose and excitedly took his catch. He peered into the rabbit’s dead eyes, which only moments ago had gleamed as they’d looked around for danger. Before uncertainty could creep through him, he reassured himself. I’m only doing it to survive. Out here Jake could see the truth of what “killing to live” really meant, and he never took an animal’s life for granted. He carefully placed the rabbit in his pack and broke down the trap, and then set off back toward his dad’s cabin, pride washing through him. As he emerged from the forest into a small clearing, Jake found his dad and brother sitting around the fire pit outside the cabin. Warm flames crackled in the pit, and the smell of campfire smoke filled the air. Abe sat in the shadow of a simple wooden dwelling, tending the campfire. Taylor sat in a growing patch of white shavings, busy whittling on a branch with a hunting knife. “Hey, Dad!” Jake called back. He hadn’t known what to expect when they’d first arrived in the wilderness. He’d thought maybe they’d be making their clothes from skins and hunting or foraging for all their food. But although Abe lived off the land as much as possible, he wasn’t a hermit; he was a park ranger. He was allowed to live in his little cabin as part of his job—keeping an eye out for forest fires, monitoring wildlife, and keeping trails clear. The boys’ Jack Russell terrier, Cody, raced over to greet Jake. “Hey, boy!” Jake squatted down and affectionately tussled with the dog, letting Cody wriggle and squirm through his arms. Jake straightened up and stepped over to the fire, warming his hands above the flames. Then, unable to suppress a smile, he opened his pack and pulled out the dead rabbit. Cody raised his nose in the air, circling Jake, trying to catch the rabbit’s scent. Taylor looked stunned for a second, and then a smile spread across his face. “Way to go!” he cried. “Thanks, Bro!” Jake laughed, pulling the rabbit away from the eager dog. “Thanks, Dad,” Jake said, and grinned. He looked into the flames. Being back with their dad after so many years was great—he’d taught them so much since they’d been here. Not just the normal school subjects but all about the wilderness, which he knew like the back of his hand. “Of course I know that!” Jake snapped back. Way to ruin the moment, Taylor. That explains a lot, Jake thought. Their dad was preparing for winter as if he were readying a castle for a coming siege. In fact, the thought of winter was beginning to scare Jake. Jake and Taylor shook their heads. Taylor hunkered down beside his dad to listen, wrapping Cody under one arm. Jake sat on a stump and warmed his hands by the fire. On the horizon the sun was setting and the dark was already drawing in. “Did you catch him?” Taylor asked. “?’Fraid not, buddy. He got away, but not before he’d led me deep into the woods. I was totally lost.” Abe plucked a whap-whap-waaa sad set of chords that made the boys laugh. Jake leaned forward, listening hard. “Then what?” Jake asked. Out of the corner of his eye he saw Taylor stand up and rummage around in his pocket. Jake was about to ask what Taylor was up to, when his dad fixed him tight with his stare. As Abe went on talking, Taylor crept up behind him and pulled out the wooden carving he’d been working on earlier. “Raargh!” he yelled, waving the carving in his dad’s face. It was a miniature wolf with gaping jaws. “Argh!” Abe cried, caught off guard. He let a broad grin arc across his bearded face. “You nearly had me!” He dropped his guitar and wrestled Taylor and his wolf to the ground. “This one’s much fiercer than a wolf,” Abe said, and chuckled, letting go of Taylor. “It’s coming for you next, Jake,” Taylor growled, brandishing the carving in his brother’s face. Jake added another log to the campfire and sat back, in mock fright. “What do you mean?” Taylor asked. Jake thought it over. “Six weeks?” he said, fearing the worst. It would be tough, but he figured they could survive being cut off from the world for that long.